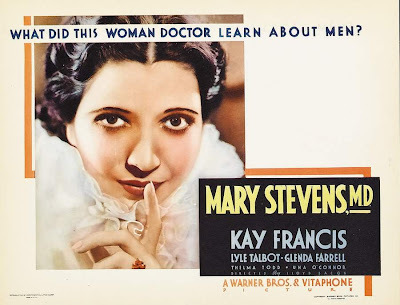 Cinema OCD: Mary Stevens M. D.
Mary Stevens is a wonderful pre-code soaper. I've already expressed my undying love for Kay Francis in past entries and this movie is one of the reasons why. She is so smart, determined and beautiful, that I can't help but think she put a large part of herself in the role. Lyle Talbot is another of those pre-code stars who slipped into supporting roles. I remember him as Ozzie Nelson's neighbor from Ozzie and Harriet. Lyle was very good at playing the good looking, virile scoundrel as he did here and also in Three On a Match. And Glenda Farrell is always a treat to watch. She and Joan Blondell are both from that brassy, wisecracking dame school.